"The balance of flavor in the rosemary herb, spice in the ginger, and touch of extra sweetness in the honey balances this dish out to accompany any other part of your meal." Preheat oven to 400 degrees F (200 degrees C). Lightly butter a large baking dish. Whisk honey and milk together in a bowl until smooth. Place sweet potatoes in a large bowl. Add honey-milk mixture to sweet potatoes and toss to coat; soak for 10 minutes. Drain 1/2 of the liquid from the bowl. 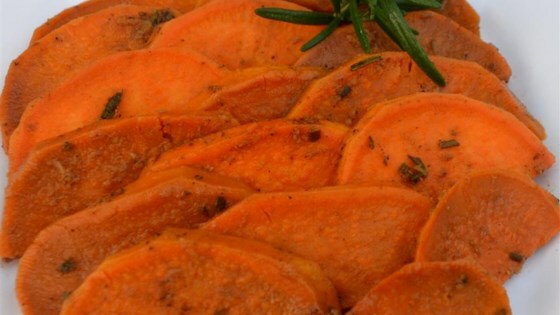 Mix ginger, rosemary, grapeseed oil, cardamom, black pepper, cloves, and salt with the sweet potatoes until coated. Spread potatoes in a single layer in the prepared baking dish. Bake in the preheated oven for 20 minutes. Flip potatoes and continue cooking until tender and browned, about 20 minutes more. The nutrition data for this recipe includes the full amount for the honey-milk mixture. The actual amount consumed will vary.